Historian Bob Libershal will give a presentation on the U.S. Grant Quilt and letters. "The Banner Quilt for General Grant, sewn by the Ladies’ Social Circle of Eureka, that they auctioned at their festival and Fair held at Brett’s Hall in Eureka on Wednesday evening, April 5, 1865, raised $1000 for the aid of Union soldiers. The two letters: one dated July 7th from Mrs. E.M. Hines was sent to Grant with the quilt. The other, a thank you note to her on official army stationery and dated October 6, 1865, was signed by General Grant. 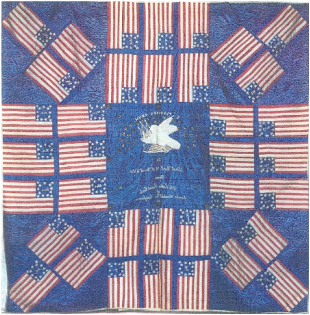 One of the most significant items ever acquired by the Clarke, the banner quilt was a 1991 donation from the descendants of Ulysses S. Grant. They had decided that the quilt should return to Humboldt County. The two letters were donated in 2005 by a couple who had learned of Grant’s quilt at the Clarke Museum, and chose to reunite the letters with it. The letters are most important as companion artifacts to the quilt. It is fitting that these three items now reside together, preserved in the collection of the Clarke. The letters have prompted a renewed look into the history of the famed banner quilt. The letters provide more information about it, and have led to further research. Also, a review of Humboldt Times newspapers during the civil war years has revealed previously overlooked articles. Though some mystery remains, much has been clarified and will soon be shared."